Program "The Hero of our time" is a branch of a youth program "Discovery" which is carried out at the Youth Almaz Center (the town of Ruza, 100 km from Moscow). Real life enactments and situations which occur during actual expeditions serve to develop positive moral and physical qualities in a person, such as: independence, self-confidence, collaboration and an ability to make a decision. The Program Discovery allows to emulate real life tasks of varying complexity and promotes desire to improve one's skills in the conditions of limited space and limited time. The motto of the Program: "Joint actions – guarantee of success" is the continuation of the popular and successful mountaineering ascents and pioneer expeditions. 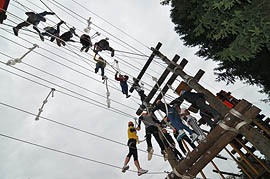 The main task of participants is to offer one's hand to a friend in due time, to take responsibility for the next step, to overcome fear of height and to cross the Rubicon – the obstacle course at 4.5-9 meters height. The full potential of the Program is revealed when participants, barely knowing each other all having different personalities, display compassion and respect towards each other, and in doing so, demonstrate teamwork which propels them to achieving a common goal. Gain confidence, communication skills, persistence and make new friends. Become full of optimism and share fun and excitement with his/her peers. The Rubicon Courses is a new generation of the Rope Courses. 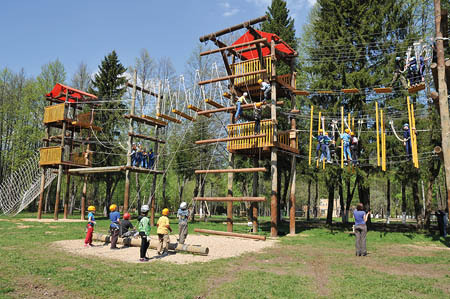 Eight successive exercises comprise a unique obstacle course of 160 meter length. All exercises are performed at 4.5-9 meter height and each differs from the other by its degree of complexity. For the first time, the exercises of the High Rope Courses focus on the team work and not on personal achievements of each participant. The Program "Discovery" at the NTV TV Channel.